The Anti-Narcotics Force (ANF) is a Government security agency,tasked with combating the drug smuggling and its use in Pakistan. Now ANF has been authorized to examine export consignments for drugs prior to customs procedure before these goods were first examined and cleared by customs then Anf detained consignment at the last stage for inspection. Procedure To Clear Container From ANF Examination. 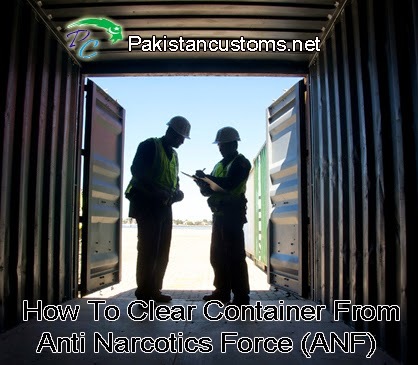 Customs clearing agent or Exporter will clear when a container is held by Anti-Narcotics Force (ANF). Therefore we share step by step guide to clear ANF Hold. When a container is held by ANF so the first step should be taken to get the container grounded in the terminal where the container will be examined. its terminal operator `s (KICT/ PICT/ QICT/ KPT/ NLC) job to ground the container in the examination area. Exporter and Clearing Agent can be confirmed container `s status whether it ground or not on below given contact numbers or manually request to ground your container. After arranging containeR, the ANF examine the goods take pictures of every item. When the examination has been completed and everything found correct so ANF officer allows terminal labour (Carpenter) to close or repair cartons and again load goods in the container. As goods again load in the container then ANF again seal the container and take pictures of the close container. 7- Finally Inform Help Desk To Clear Container. Finally, Anf officer informs concern terminal `s help desk to release this container. that`s all.